OLD WINDOW WORKSHOPS ARE WOMEN-OWNED, WORKER-OWNED BUSINESSES located in low-income urban neighborhoods, open to all low-income women who want to work cooperatively and creatively with other women to improve our economic opportunities and take action to make our neighborhoods safer, healthier and more beautiful places to live. Old Window Workshops exist for these women. Hunger and the threat of homelessness are experiences that women, working together, can put farther and farther behind them. 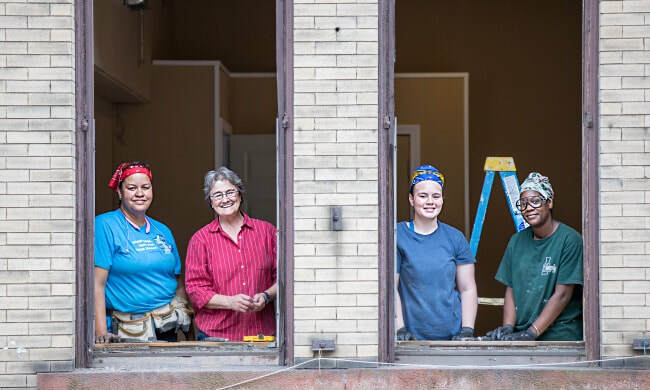 Old Window Workshops are free from sexual harassment or intimidation of any kind, where the primary requirement is that women give support to each other using higher education and higher skills for financial sustainability. Our first goal: Create jobs for women which pay a decent hourly wage, provide paid time off, allow each worker to control the hours she works, and a high school diploma, driver’s license, working vehicle or even fluent command of English aren’t necessary to get started.